The Greenwood Academies Trust was established in 2009 as a not-for-profit education institution, and today educates approximately 16,000 pupils across 32 academy locations. Back in 2015, the Trust was struggling to generate and post enough quality content to keep parents and the local communities engaged on its social media accounts. Recognising the need for a new approach to managing its social media presence, the Trust looked to allow a greater number of staff to contribute to its social media communications, but at the same time manage the risks associated with such a complex social media environment. Today, the Trust has complete visibility and control over all social media activity, and has significantly increased the level of social media engagement with parents and other stakeholders. Embed a content validation process that allows 120 members of staff to create and post content to social media in a safe and controlled way. 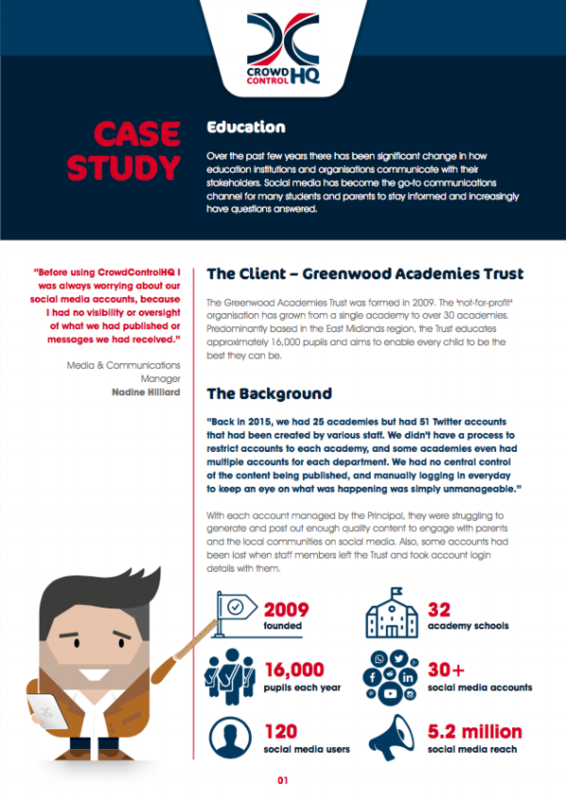 Establish a joined-up process for centrally managing 30+ different Twitter accounts, with the Media & Communications Manager collaborating with staff at each academy. Mitigate the most common risks associated with large-scale social media use to protect the organisation and its staff. Create regular reports on social media activity and performance to support management decision-making. Reach an audience of over 5.2 million on Twitter.